Veteran action hero Wesley Snipes isn't getting out of prison until July 2013. I guess he's just not as slick as his alter-ego, economic hitman Julius Styles, who's getting released into the custody of the iTunes App Store next month. While Wesley's been serving his three-year prison sentence for tax evasion, Finnish game developer Lapland Studios have been working on a way for Snipes to be set free, at least within the confines of the iPhone and iPad. 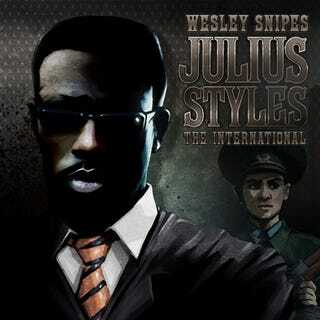 Announced earlier this year, Julius Styles: The International is hitting iTunes on August 11.
Who Wants To Be Remembered For A Crappy Wesley Snipes Game? The title character is essentially Wesley Snipes, only more suave, sophisticated, and deadly. It's essentially an amalgamation of Snipes and the roles he's played in movies like Art of War and Murder at 1600, only sexier and better suited to avoiding federal tax evasion charges. See, Julius Styles is an economic hitman, a special ops warrior in the employ of an international consortium of businessmen, tasked with making sure they get their money without ending up in prison. He's an expert at persuasion, blackmail, assassination, and hacking. Yes, this is an action adventure game in which you play the version on Wesley Snipes that wouldn't have to arrange special furlough in order to record his voiceovers. Lapland has announced that the first episode is coming out for the iPad and iPhone on August 11, sort of like the Supreme Court of the United States announced they had rejected Snipes' appeal last month. Who's excited?